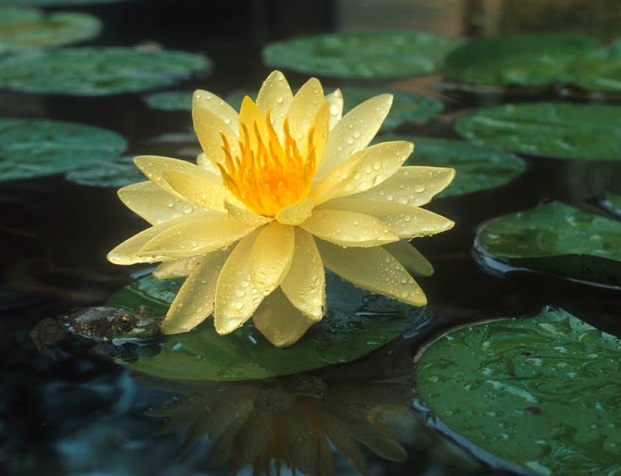 I have to confess I never thought much about water lilies until I started working at Aquascape. And now every day I get to work in the midst of these gorgeous aquatic flowers. 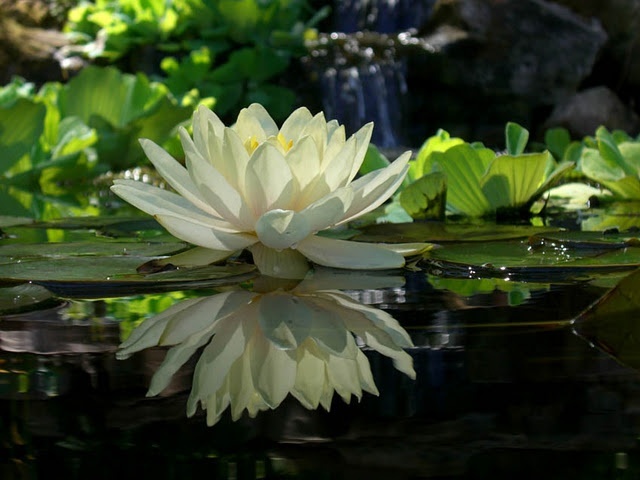 Water lilies create a gorgeous reflection on the water’s surface. 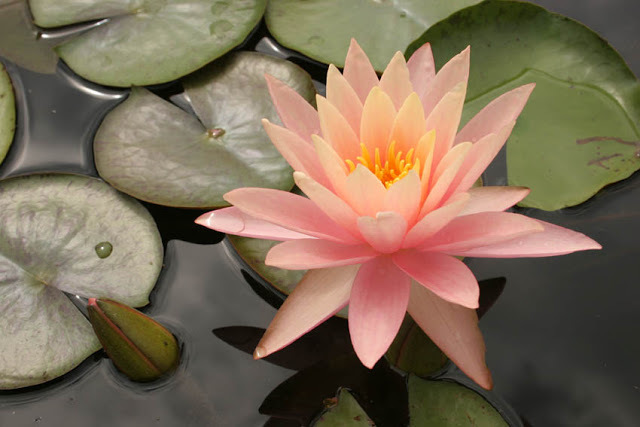 This water lily is called Pink Grapefruit and can get quite large. 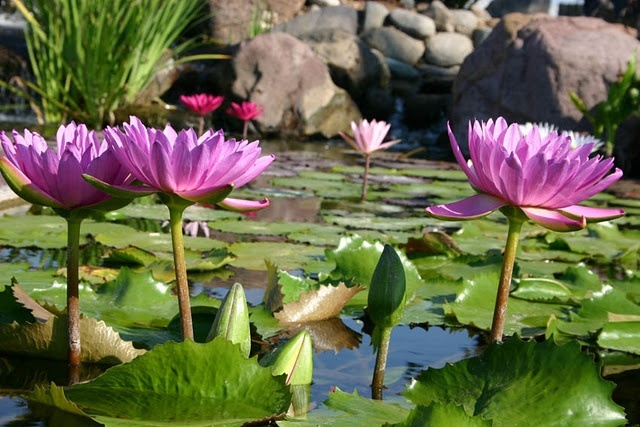 My favorites are the purple water lilies. This Panama Pacific lily is vivid with a glowing center. Lilies come in both a hardy and tropical variety … like annuals and perennials. 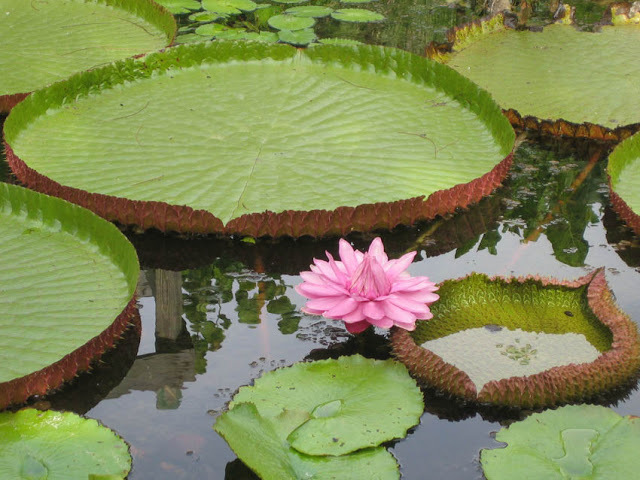 The Victoria water lily is especially memorable with its huge lily pads and unique flower. 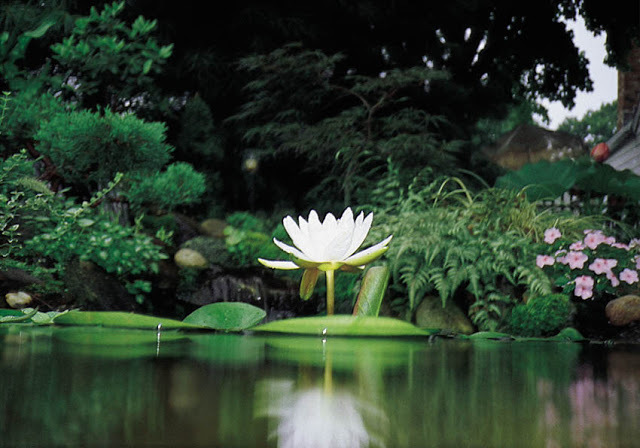 When you have a pond, you enjoy both the beauty of water lilies and the song of croaking frogs. If you build it (the pond) … they will come (the critters). Do you see him? 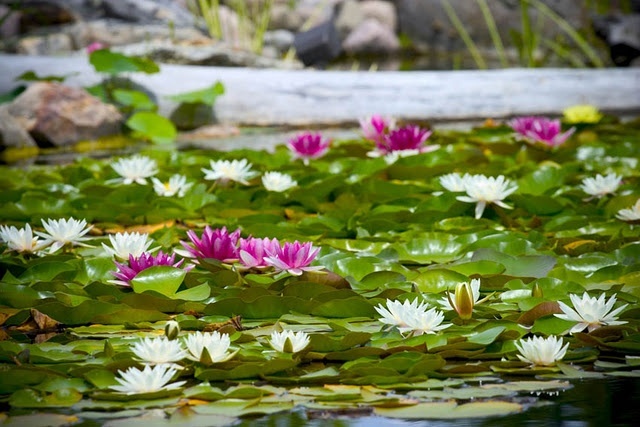 If you’ve fallen in love with these photos of water lilies but aren’t quite ready for a backyard pond, don’t despair! 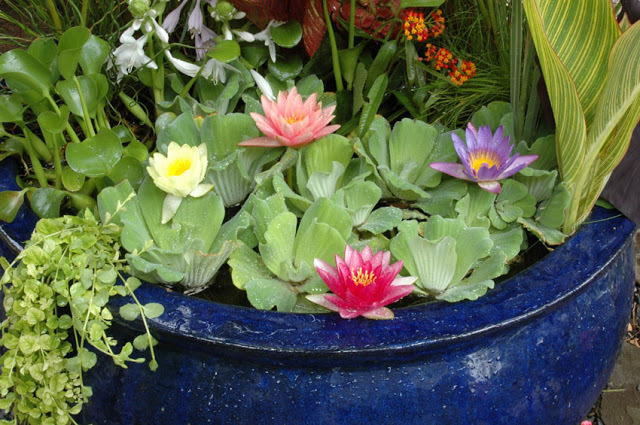 You can grow water lilies in containers! In this container water garden, lilies are paired with water lettuce (my favorite aquatic plant). 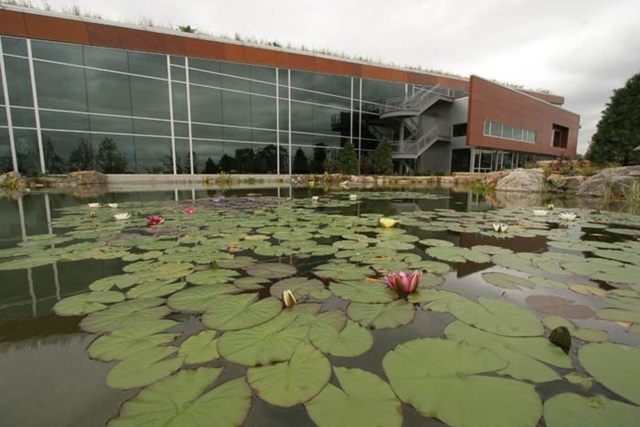 And this is Aquascape … where I work. I get to look out the window and enjoy a sea of beautiful water lilies! I’ll share more about water gardening throughout the summer. 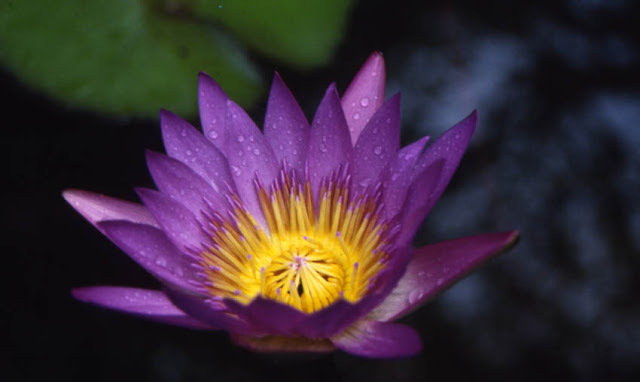 Want to see more water lily photos? 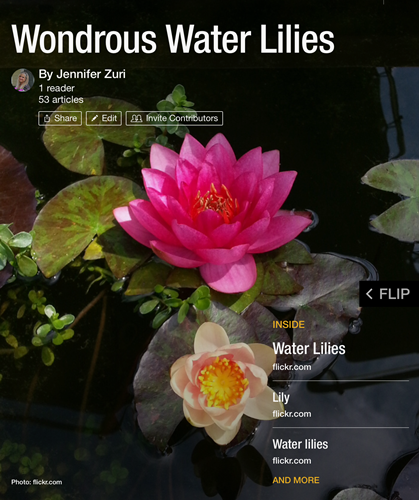 You can view my Wondrous Water Lilies Flipboard magazine. I’ve always been envious of people with large enough ponds to grow water lilies. Now I know that I can grow them in my little water feature – yahoo!! Next year, they will be added to my shopping list along with my favourite water lettuce. I had no idea that water lilies where something pretty. They are so beautiful! Thank you for sharing the beautiful photos! Oh, these are simply gorgeous!! Those are impressive lilies….I love those Victoria lilies as they are quite stunning. funneling rain from the upper yard down into it regularly, and keeping it wet and boggy for the birds and the frogs and toads. What a great place to work! You must see beautiful flowers all the time! I just put in a pond last month. Finely got plants in last week. Bought a bunch of starts on Ebay. Noticed this morning the three water lilies already have pads reaching for the surface. So excited!!! I so miss my pond! I had yellow water lilies. I really want to figure out a way to have a water garden here at the patio apartment. But there’s no electrical outlet outside, so would have to be a different pond than I’m accustomed to. Water Lilies are on my list of new things to try. We are trying to figure out the best type pond to make. I am thinking a stock tank would work best for us. These are sure lovely. I am loving the lilies…they’re so gorgeous! I am so impressed by these images. I have been wondering if it would be worth the maintenance to put in a pond, but these images persuade me all the more. I live in an area that is very suitable for such a feature and will have to show the idea to my husband. Thank you for the ideas.